Wizardry, directed by Shunya Fujioka. 50 minutes. February 21, 1991. Dungeons & Dragons™, according to Wikipedia, was the first role-playing game and the start of the role-playing game industry. It was launched by Gary Gygax and Dave Arneson in 1974, and was immediately popular with American gamers. During the 1980s, it was heavily merchandised and became a worldwide phenomenon. The Wizardry role-playing games, inspired by D&D, began with Wizardry: The Proving Grounds of the Mad Overlord in 1981. 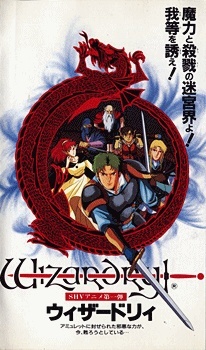 They were up to Wizardry VII: Crusaders of the Dark Savant by 1992, the year that this Wizardry OAV was released in Japan, based on The Proving Grounds of the Mad Overlord. Reportedly the games were more popular in Japan in the 1980s than in America, because the Japanese did not get the jokey American pop-cultural in-jokes, such as Murphy’s Ghost (as in “If anything can go wrong, it will”), and it seemed more seriously dramatic to them. 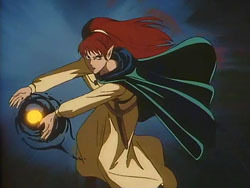 The OAV was produced by TMS Entertainment and released on VHS by Shochiku Fuji. In a prologue, a party of three questers – Alex, a traditional European swordsman, Shin, a traditional Japanese samurai, and Hawkwind, a traditional ninja – have found a treasure in a dungeon. It’s apparently only a minor treasure. Alex explains as they enter Werdna’s dungeon about Great Wizard Werdna stealing the magic amulet from King Trebor, who has called on all questers to go down to the tenth level in the dungeon to retrieve it. They are attacked by zombies, and Alex’s leg is hurt. 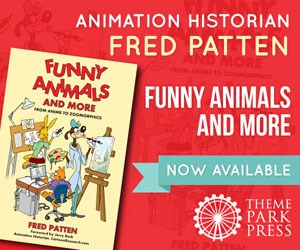 They are saved by Joeza, an elderly wizard, and Albert, his young apprentice (the OAV’s cocky comedy relief). Their large pointed ears mark them both as elves. Joeza uses his magic to heal Alex. Joeza explains that he, Werdna, and King Trebor used to be a team until Werdna betrayed them all and stole the amulet. Its spell will give whoever breaks it power to control/end the world, and Werdna has already unlocked it halfway. Joeza has been tracking it for years, growing old; this is his last chance. Albert proposes that they join forces, but Shin and Alex say that they’re only going down to the ninth level after treasure. They agree to stay together for that long. On the ninth level, they find that another party has all been killed (is that Morgan’s body?) by giant Greater Demons except for Sheer (Shiela? ), an elf warrior woman. The Greater Demons are controlled by Flack, Werdna’s evil clown whose spells can turn someone into stone. Shin kills him despite Sheer’s protests. She says that Flack was her only clue that could lead her to Randy, a warrior who is her lover. He disappeared after having been taken over by the Muramasa Blade, a phantom demon sword of immense power that will take over anyone not strong enough to control it. The three questers decide to accompany Joeza and Albert to the tenth level after all, since Sheer is also going there to look for Randy. She has a song that may cure him. Meanwhile the Vampire Lord, Werdna’s henchman, warns him they are coming. Werdna (dressed in what looks like a Catholic archbishop’s ceremonial robes – apparently designed for this OAV; American drawings just show a black hood with two glowing eyes looking out) will leave it to him. (Despite saying this, Werdna appears to prepare to confront them personally. The questers find Randy. He is under the spell of both the Muramasa Blade and of Werdna. He cuts off Shin’s arm. Sheer is forced to kill Randy with the Tiltowait spell. Joeza reattaches Shin’s arm with magic. The questers burst in upon Werdna and the Vampire Lord, but Werdna has just unlocked the amulet. 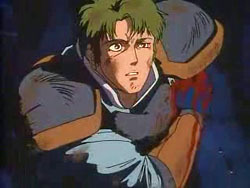 The Vampire Lord is killed by Shin, but Werdna kills Albert. Joeza restores Albert’s life, but at the cost of his own. Werdna succeeds in unlocking the full power of the amulet, but Shin gains the power of the Muramasa Blade and advances upon Werdna. 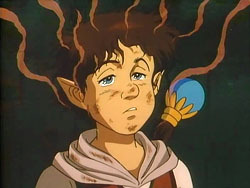 He cuts Werdna in half, and Werdna falls upon the amulet which explodes, destroying the tenth level, then goes dark. An epilogue shows the questers at the graves of Randy and Joeza. Sheer buries the inert amulet at Joeza’s grave. Shin offers the Muramasa Blade to Sheer to bury at Randy’s grave, but she tells him to keep it. The animation under the closing credits implies a romance between Shin and Sheer. The questers ride off, totally relaxed; Sheer is riding sidesaddle and Hawkwind is unmasked. The final credit is to Andrew Greenberg and Robert Woodhead, the creators of Wizardry. I could never understand the need for a masked ninja among the questers, but that’s how it’s set up in the rules for Wizardry. As I said, the amount of English superscripts in this (not including the subbing, which was added later) was apparently for the Japanese market, since I couldn’t find any indication of an American or a British release. Off-topic, but I love that little trademark logo on D and D. It’s cute….. It makes this site a lot more LEGIT that way! And I was wondering how Marvel’s (Later Saban’s) version of D&D (animated by Toei of Japan) Had that ominous opening showing D&D as a theme park “dark” ride instead of the group of youngsters playing the board game and a mysterious game piece took them into the realm of D&D? 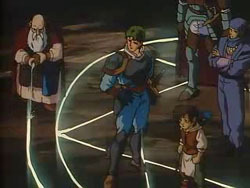 Wizardry looks a lot better than the animated animé version of D&D. It’s got a better excuse not to pussyfoot around the subject! Which seems kinda funny in retrospect since Robert Woodhead still operates AnimEigo to this day. 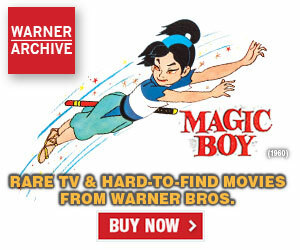 He probably woudln’t had any trouble releaseing a subbed copy of Wizardry on VHS if he had asked back in the 90’s. These days he’s a little too busy with all those kickstarters that make their goals it seems. Still it’s fun to imagine finding sealed copies cramped into dusty shelves of your local comic/RPG shop for years since nobody cared to buy it! The superscripts or notes, were added during the subbing too. We got a lot of them provided by translator and the person they were working with. Some of them I added and edited all of them myself to make them fit with the subs. We got the raw (from what I recall laserdisc source) and translation file provided at the time in 2006 and ended up cleaning the script up, revising certain things and getting the translation checked before releasing it as Ureshii fansubs. We tried to get people who actually played the game involved but that was quite hard, I ended up trying a little bit of it but it was quite intimidating for someone who never played that style of game. We ended up using a lot of fan sites and cross referencing it with who provided us with translation. What I know is that AnimEigo did not license Wizardry anime.